We are pleased to announce that this spring, the Standing Rock Sioux tribe officially launched a large-scale language revitalization initiative. Chairman Ron His Horse is Thunder is fulfilling his commitment to bring Lakota language back to the people of Standing Rock. The initiative, undertaken with the technical assistance of the Lakota Language Consortium, provides every K-12 student on the reservation with Level 1 and Level 2 textbooks, as well as supplementary materials. Over 2000 students in eight schools will participate—the first coordinated effort by any of the Lakota tribes to fully implement the language revitalization curriculum. The tribe’s initiative is being directed by the Education Committee under the leadership of Jesse Taken Alive and the SRST’s Tribal Department of Higher Education. 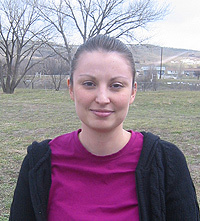 Managing and coordinating the training and scheduling of the program, is Tribal Education Manager, Ms. Sacheen Whitetail, who has worked diligently to ensure that all participating schools teach Lakota for the necessary number of hours per week. The tribe’s hope is that this effort will encourage schools to become more fully involved in teaching to tribal youth. At the beginning of the school year the materials will be distributed, and the tribe and LLC personnel will introduce parents and communities to program goals, and provide some practical help for parents in assisting their children with language learning in the home, and supporting its use in school. The goal of the initiative is for students to achieve proficiency in Lakota after the fourth year of regular use. By the eighth year, the tribe expects that there will be some level of fluency for the children in reading and writing. One important way the tribe will help ensure their goals are being met is by implementing pre- and post-tests for all students studying the language. This will help determine how schools are doing in their instruction of Lakota, as well as challenges students face in their studies. The results of these tests will help schools improve their language programs, while establishing more accountability for teachers and students alike. 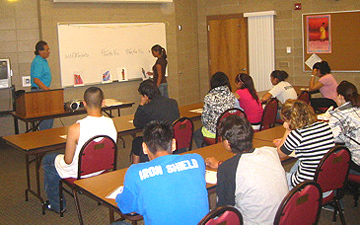 Critical to launching this program is a thorough teaching-training program in June 2007, a three-week summer course taught at Sitting Bull College in Fort Yates, North Dakota. More than 30 teachers working with Lakota language in the Standing Rock school systems will join this intensive training session. Between Aug 15th and October 1st, LLC completed the pre-testing of over 5000 Lakota language students in thirty schools across North and South Dakota. All students grades K-12 took the Level I Pre-test Examination which consisted of twenty computer-based questions. Each question used four pictures and one audible word (in Lakota) transmitted through headphones. Students were asked to select the correct picture that corresponded to the word they heard. General results of the Pre-test indicated that the majority of the kids were testing far below adequate levels for this beginner-level test. Of course, Post-test results are expected to be higher when undertaken in Spring 2008. In general, only a small handful of high schools such as Tiospaye Topa, Takini, Red Cloud, and Cheyenne Eagle-Butte High Schools were testing at a satisfactory level on the Pre-test. The ideal testing results would be to have the early elementary students achieve this same level of results. As a whole, elementary kids were testing at a slightly better level than chance. 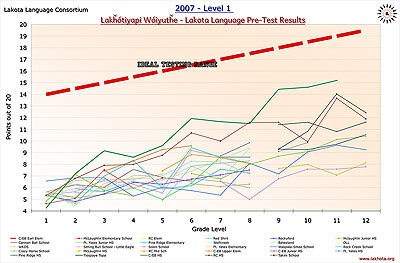 In addition, Lakota language levels improved only marginally as grade levels increased. Schools of all types participated in the testing: both reservation and off-reservation schools; parochial; BIA; contract; and State-administered schools, including those in urban and rural settings. None of these school-type factors played any significant role in testing results. The only general correlation was evident among schools that took Lakota language teaching seriously and teachers who were trained and used the curriculum materials correctly had greater success than those that made less effort. The top performing school was Tiospaye Topa in La Plante, SD, whose teacher Les Ducheneaux is an enthusiastic user and champion of LLC materials. 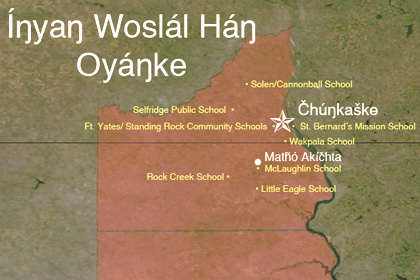 Three of the four top schools work on the Cheyenne River Reservation in South Dakota. On student response to the tests, all children clearly were very excited to be taking the test, and were enthusiastic about the challenge and were also anxious to achieve the best results. Unfortunately, after learning their results many ended up disappointed in finding how little Lakota they actually knew. They compared scores among themselves and those who did well were very proud of their achievements, finding themselves in the spotlight. Nevertheless it was obvious that almost all the children demonstrated a deep willingness to learn and know their language. And many look forward to learning over the school year, and doing better on the Post-test in the spring. So the tests served as a valuable boost for many and a great challenge in the future for all. A Lakota Language Teacher Workshop will take place in Fort Yates, ND on the Standing Rock reservation, on Thursday, December 6, 2007. This one-day training is for Lakota teachers who want to improve their classroom management skills and learn new techniques for second-language instruction. The trainer, Bill Johnston is Associate Professor for Second Language Studies at Indiana University, Bloomington. 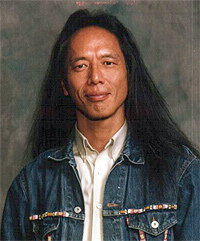 He specializes in training second-language teachers and has experience in Dakota language immersion. The workshop will address four key areas: organization of learning, classroom interaction patterns, successful lesson planning, and identifying and addressing problems of classroom management. Linguistic Director, Jan Ulrich will also be available at the first hour of the workshop, which will be dedicated to a question-and-answer session as a follow-up to the summer 2007 workshop in Standing Rock. 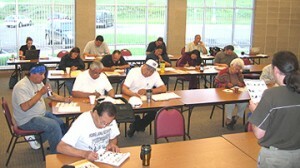 Lakota language teachers in a lesson on Lakota phonology. Volunteer student demonstrates what she has learned. 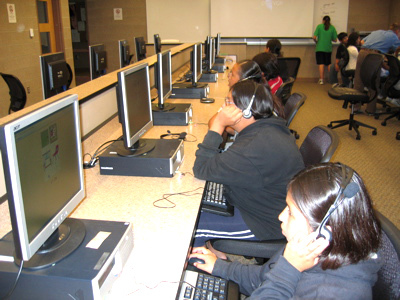 Beginning in August-September 2007, LLC in cooperation with its 35 partner schools throughout North and South Dakota will begin a unique, standardized, multi-media computer-based pretest for all the students taking Lakota in public and tribal schools. The pre-test will serve as a benchmark that will allow teachers, administrators and parents to gage the success of these language programs, and to help identify challenges and areas of improvement. This will be followed by an end year post-test that will also record how well students improved in various participating classes and schools. This assessment procedure is a critical step in bringing accountability to the teaching of Lakota and will help bring the teaching of the language greater transparency, and in the long run, more credibility. This kind of testing positions the language to be on par in terms of importance with that of other subject areas, hopefully encouraging administrators, parents and state educational officials to understand language teaching deficiencies and successes. This year’s test, limited to Level 1, will be used for approximately 10,000 children, limited Next year we will implement Level II tests in the schools, with participation dependent on levels of advancement. This pilot assessment program will provide stability to teaching and learning techniques, and will allow LLC and related programs to move forward. Teaching of the language needs to be supported in the best possible way, and proven ways of enhancing teacher and student performance are needed. The Consortium endeavors to produce the best materials possible for teaching the Lakota and Dakota language, but even the best materials are not effective unless teachers are trained to use them successfully. To promote improved teaching, LLC will be expanding its training offerings in the coming year to encourage and facilitate more effective teaching habits. 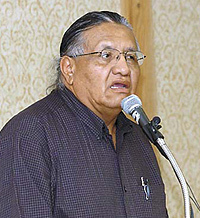 Beginning in June 2007, a three-week, three-hour accredited course will be taught at Sitting Bull College, delving more deeply into both the linguistics associated with Lakota instruction and the second-language teaching techniques that can best be employed. 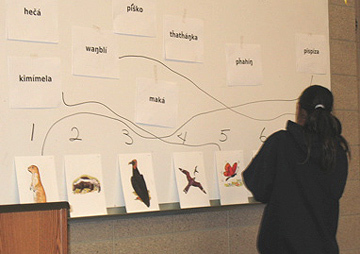 This course will be the primary introduction to skills basic to teaching Lakota effectively in the classroom and is divided into three parts: Lakota phonology, Lakota morphology and methods. The first section is an overview of the Lakota phonetic system and will focus on training teachers to be consistent in writing the language. The second week is aimed at developing an operational understanding of the underlying structure of Lakota inflectional morphology and some parts of derivational morphology. Week three of the course will prepare teachers to use techniques that create a positive learning environment and which help students feel secure in language learning. As an intensive overview, this course begins by preparing teachers in the latest and most effective language teaching techniques currently in use around the world. Special emphasis will be on methods that work for teaching the four basic language competencies: understanding, speaking, reading, and writing. Teachers will also learn how to motivate students and young learners and how to structure language classes to keep the students interested. Due to the high demand for this course (with Standing Rock classes only able accommodate local teachers), we plan to see the offering extended to other reservations and tribal colleges, and involve new tribes in language recovery and revitalization. 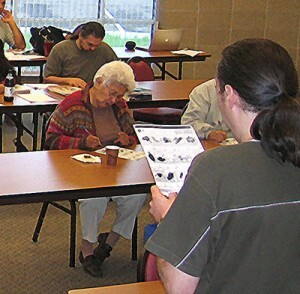 In addition to the intensive three-week course option, LLC will continue to offer two- and three-day workshops in fall and winter 2007 for educators to learn some of the basic skills needed for instructing Lakota-Dakota language, including components such as pronunciation, use of orthography, and phonology. Lesson plan modeling and hands-on demonstrations will be central to these workshops, open to all teachers and other interested community members who wish to improve their language-teaching skills. Please email training@lakhota.org if you are interested in finding out about trainings in you area . 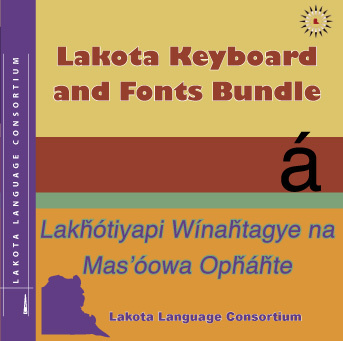 In July 2007, the Consortium will launch a complete Lakota language keyboard and font package for PCs. The package will have customized software that will automatically switch the keyboard to type Lakota and Dakota characters. The software will include many features that will make typing in Lakota-Dakota easier and more accurate. The software offering contains four complete font packages that will be versatile enough to be used for most conditions. The package will also include twelve labels for use on both white and black keyboards, offering visual cues that will promote accurate typing. The overall effect of the keyboard package will be to promote a more consistent use of the Lakota language, and to encourage more literacy and extensive communications in the language. Because these fonts are Unicode based, they will work on any computer and in all emails and websites. We expect these keyboard packages to be in place in most Lakota schools by the end of the year.